One of the scariest realizations as an author is that you don’t legally own what you wrote. Those words you put all that conscious effort into composing are now owned by someone else who can do almost anything they want with them. Does that sound like a new horror flick? Unfortunately, it’s all too true, and it’s what happens to most authors when the sign on to have their book published by a traditional or hybrid publisher. So how do you keep your legal rights (and profits!) as a self-published author? 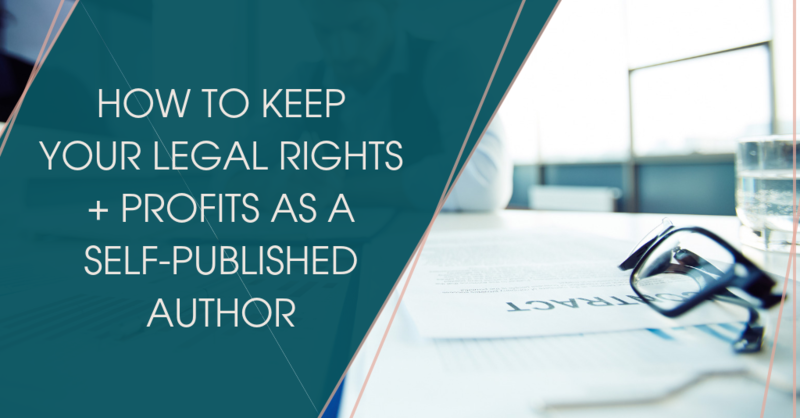 There are two key things you need to keep under your own name in order to keep your legal rights to everything you write, as well as the most possible amount of profits from sales: ISBN numbers and upload accounts. You’ve probably seen ISBN numbers in the front of books before, and possibly used them to search for a book at a bookstore. ISBN stands for International Standard Book Number and every book that seeks to be sold commercially should have one. We recommend to our authors that they buy two separate ISBN numbers—one for the paperback version and one for the hardback version. Your e-book version doesn’t technically need an ISBN number, but you can assign one to it if you like. ISBNs are sold by ISBN agencies within each country, and many of them offer packages of ISBN numbers—anywhere from 3 to 10 ISBNs in a package—that make it easy for you to buy them before you publish your book. So why do you need to purchase your own ISBN numbers instead of having a publishing company or someone else do it for you? Owning the ISBN numbers to the various versions of your book is the first step to securing the legal right to what you’ve written. While an ISBN number is not the same thing as filing for actual copyright, it does identify you (or whoever purchased it) as the publisher of the book, who is often the holder of the copyright and overall legal rights to the book being published. You’ll often see your ISBN number in the barcode on the back of your book as well. If you’re selling the book on Amazon and uploading via the CreateSpace or IngramSpark platform, then they will automatically add the barcode for you and you DO NOT need to purchase them when you buy your ISBN numbers (see below about Upload Accounts). Now you’ve purchased your own ISBN numbers, finished all the writing, editing, and formatting. It’s time to upload your book to get it ready to be sold! Where do you upload the different versions of your book? IMPORTANT EXCEPTION: If you want bookstores and libraries OUTSIDE of the USA to be able to buy your physical book to have at their locations, you’ll need to upload your hardback AND paperback version to IngramSpark (which means you wouldn’t upload your paperback to CreateSpace at all). So why do you need to create your own accounts on KDP, Ingramspark, and/or CreateSpace? You’ll notice that when you sign up for accounts on these websites, you’ll also need to put in tax information. That’s because you’re the author AND the publisher of the book, and you’ll be the sole person getting the royalty payments for the sale of your book! Depending on the country you’re in, that also means you may have to claim the royalties that you receive as a source of income, but it’s worth it. By owning your own ISBN numbers and being the sole receiver of the royalties of your book, you’re fully in control of your legal rights to the intellectual property that you created! Unlike traditional publishers or hybrid publishers who take a portion of your royalties for every book or e-book sold, we don’t do that. We upload your book, with your ISBN numbers, to your upload accounts, so you get all the rights, all the royalties, and all the excitement of being a published author.